The Way Theatre/Studio – More Shows! We’re delighted to be returning to the Way Theatre/Studio in Atherton this month for more all ages, all action, all improvised competitive comedy! Tickets are now available online and can also be purchased on the door. The Way is a really exciting new space and we’re really pleased to be back there with shows in September and October. We’re also delighted to be bringing our Improvised Panto to the theatre in December which is sure to be a fine alternative festive treat. 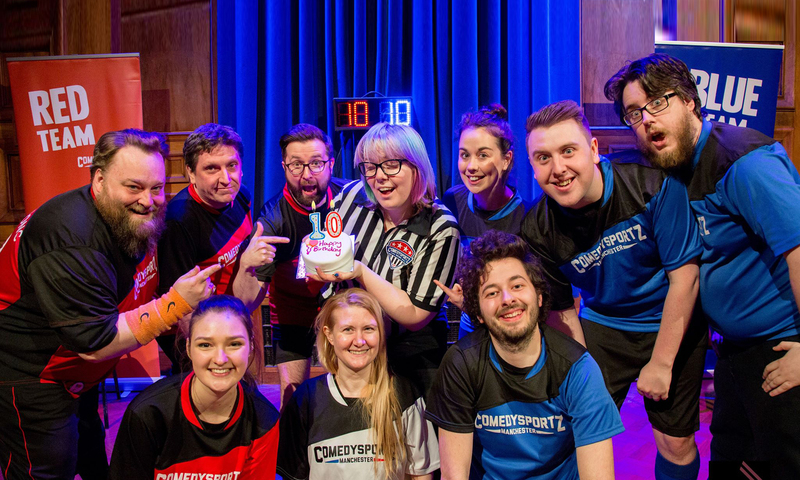 Not seen a ComedySportz show before? Two teams compete for your laughs with quick-witted gags, games, sketches and songs inspired by your suggestions. There’s a referee on hand to ensure a good clean match – it’s a family friendly show after all – with penalties for bad behaviour and bad jokes. Who wins? You decide in this family friendly show that adults and kids can enjoy! Look how ready we are! You can book tickets for ComedySportz at The Way here and for our Improvised Panto here. Previous PostPrevious ComedySportz Summer Update and The Year Ahead!